Boiler plate, stuff, mainly -- where's he going, to whom is he speaking, a few basics about free speech. But I had a question for these reporters, too. Will you run the Westergaard Mohammed? 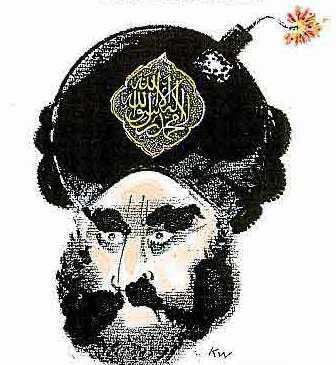 Will you print the cartoon Kurt Westergaard drew, all in a day's work, when Jyllands Posten editor Flemming Rose asked him for a Mohammed cartoon as part of a newspaper feature showcasing 12 Mohammed cartoons from 12 Danish artists commissioned to demonstrate that Denmark, free Denmark, was not under, beholden or intimidated by Islamic law? First response from the ladies and gennemen of the Fourth Estate: nervous laughter. Kurt Westergaard, 75, was almost murdered last night by an axe- knife- or hammer-wielding 27-year-old Muslim from Somalia who broke into his home. Kurt managed to get to his safe room and police arrived very quickly, shooting the would-be assassin in the course of a struggle. News reports tells us Kurt is safe. Safe. Kurt isn't safe. Nor will he be, nor any of us be, "safe" until Islamic law is stopped in the West, its deeply advanced tentacles eradicated. Because don't think it isn't here. Sharia is here and in force. To measure the extent, just watch the "free press" cover Kurt's latest (and closest) brush with sharia-sanctioned death, and count how many times that coverage is accompanied by a picture of Kurt's cartoon. Any media outlet that runs the cartoon is not under Islamic law. Any media outlet that doesn't is under Islamic law. One old Dane, however courageous, however strong, can't stop sharia alone.